Happy Durin’s Day! Whether it is, in fact today, or later this month, I’m sending everyone reading my very best. If you’re not familiar with Durin’s Day, let me provide a brief explanation. Durin’s Day is an annual holiday observed by J.R.R. Tolkien’s dwarves “when the last moon of Autumn and the sun are in the sky together”. It signifies the New Year for the dwarves. If you’ve read The Hobbit or seen the films, you’ll remember that Durin’s Day is of especially significant importance to Thorin’s company as it is the only day of the year when the light will be just right to reveal the keyhole to the secret door to Erebor. Truthfully, I’ve never really celebrated before, but this year I thought I would get into the Durin’s Day and Fall spirit by making some special treats and crafting a little. 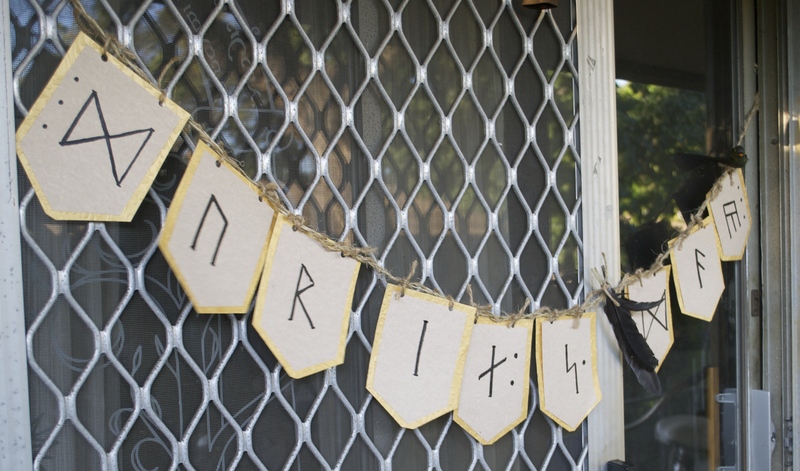 First, I decided to make a garland or banner. Scrapbook paper in natural color plus gold for the backing. Dwarves love gold. What I did: So easy and fun you guys. Great activity for you to do with your kids or even just by yourself. I don’t have kids, I’m just a big Tolkien nerd and I had a blast making this thing. I took three strands of twine and braided them together. I’d say mine is perhaps 3.5 to 4ft–rough estimate. 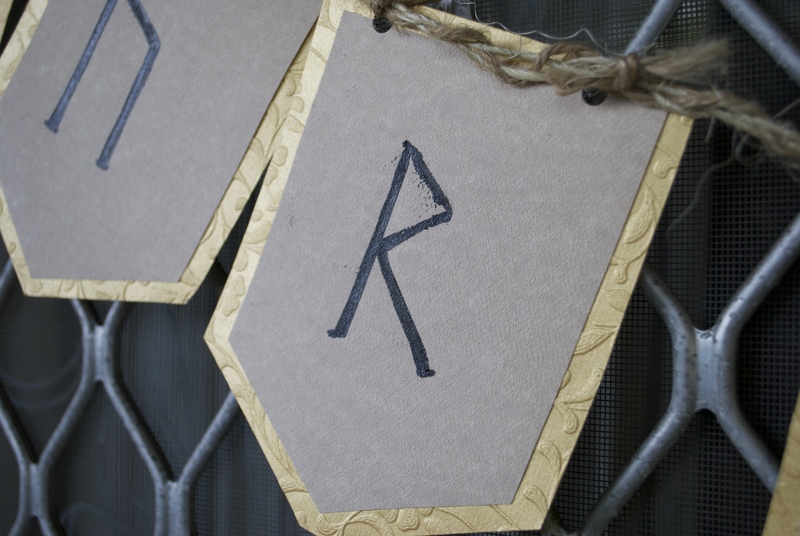 Next I decided what size and shapes and I wanted my letter papers to be and what I wanted the garland to read. I selected “Durin’s Day”. I drew an outline for the letter paper (the natural paper) and used the original as a stencil, so I’d have 9 equal shapes. I then glued those pieces on a gold backing and cut them out. I decided to use this really cool pin by Weta as a basis for the lettering. I believe there are two different sets of runes used by the dwarves, but again, I went with this set. Thanks Weta! I took my time studying and drawing each rune. 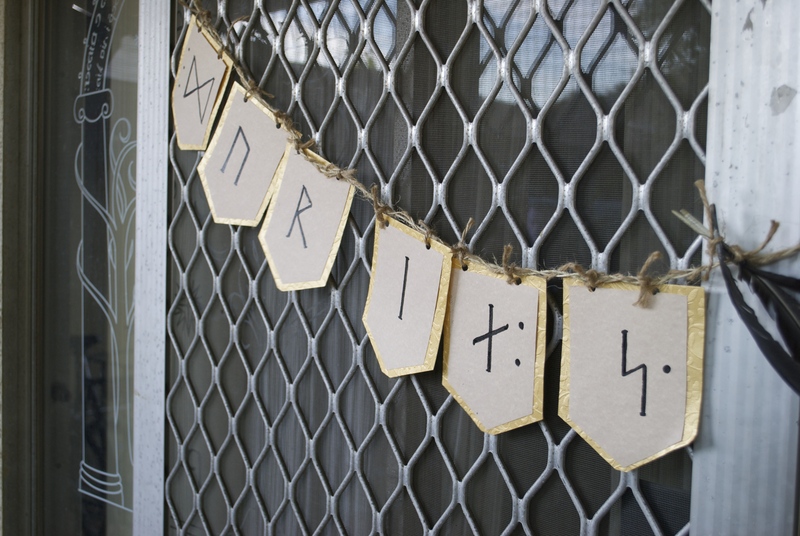 Once I finished the word “Durin’s”, I thought I would break up the garland a bit by tying together three clean, black chicken feathers that I collected from a farm visit earlier this year and securing them in between the words “Durin’s” and “Day”. It is just as easy to buy faux feathers from the craft store. I would not recommend using real feathers unless you can make sure that they came from a cruelty free environment and that the feathers are clean, of course. 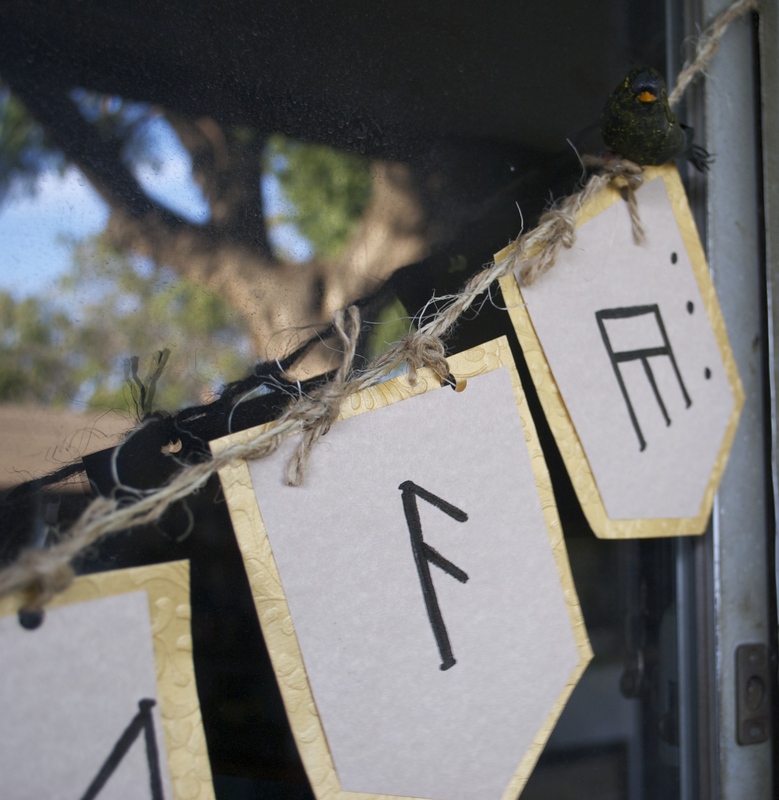 When I was finished with my runes and tying my feathers, I used a hole punch to create two holes at the top of each letter. 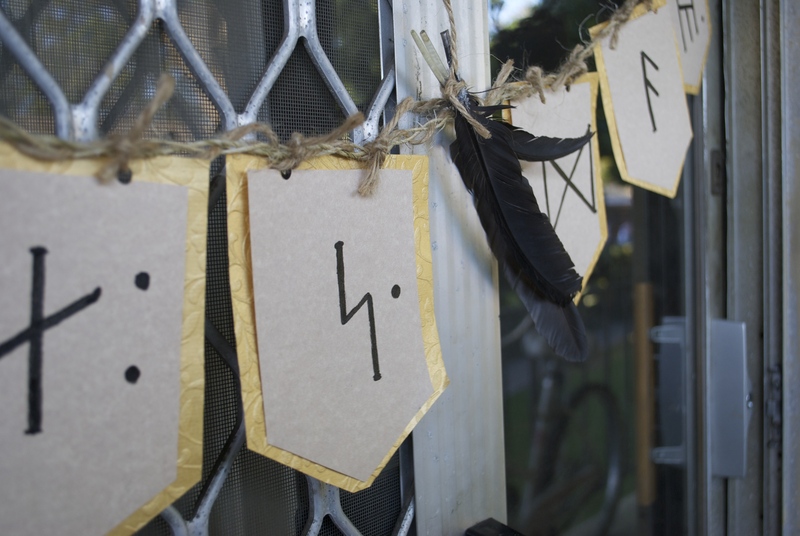 I used some short pieces of twine to tie each rune to the braided strand that I had made and set aside earlier. I also used a similar piece of twine to tie my feathers on to the middle of my garland. Once all of the letters and feathers were in place, I took my two craft store purchased birdies and proceeded to paint them black to resemble small ravens (the ravens of Erebor!). So funny, it’s Halloween time and there were NO ravens or crows to be found in this craft store, yet there were like, 7 or 8 different styles/sizes/types of spiders….Feel free to use Halloween style ravens or crows if you can find them and they are an appropriate size. The birds were conveniently equipped with clips and wire for attaching them. If you find birdies that don’t have anything to attach with, you can easily buy some alligator clips from the craft store or possibly even a store like Target (in the hair dept) and hot glue them to the bottom of your birds. I attached my birds and my banner was done! The right side/end birdie slipped down–he should be up near the top like the first. After the garland was made, I also wanted to create some special edible treats for Durin’s Day. I decided on this Orange Scented Pumpkin Cake w/ Spiced Buttercream. I decided to decorate it once again with Dwarven runes and with a bird. I simply added some raw cacao to my spiced vegan buttercream to create a darker frosting to decorate with. Preheat oven to 350°F. Lightly grease two, 8″ cake pans and set aside. In a mixing bowl, combine pumpkin, oil, sugar, non-dairy milk and vanilla extract until smooth. Add in the flour, baking powder and soda, spices, salt and zest. Use a fork to stir–using a mixer for this could make it gummy and your cakes will be ruined. Stir until well combined, but as always when making a cake batter, be cautious not to overwork the batter. Divide the batter equally between each cake pan and bake for 30 min to start. Test each cake for done-ness with a toothpick. If the cakes are not cooked all the way through in the center, give them another 2-3 min to start and then check them again. Ovens vary so greatly in exact temperature and heat distribution–my cakes took about 33 min. Once the cakes are done, remove them and let them cool for a bit in their pans. Before they cool down completely, remove each cake and let them finish cooling on a wire rack. I used this recipe by Oh, Ladycakes for the frosting. I decided on a naked cake, which means I chose not to frost the sides of my cake. I think this frosting recipe makes enough if you wanted to frost the sides, but I do suggest you try it without. 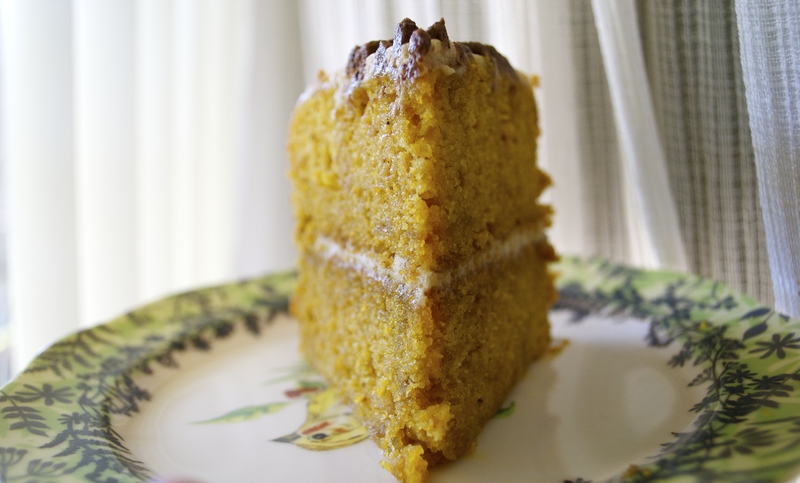 The rich, pumpkin cake with the spices and orange is nice with light frosting. I added several teapsoons of raw cacao powder (you can use cocoa as well) until I achieved the color I wanted from the frosting. 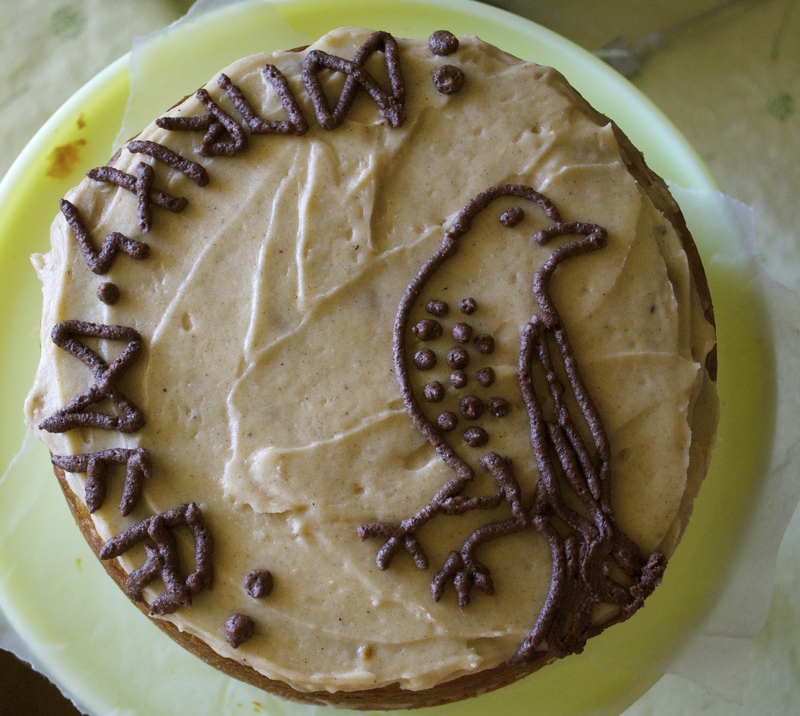 I used a Wilton piping bag and tip to create the runes and the bird. Nothing fancy–I typically don’t decorate my cakes at all, but thought this was fun. There are so many things you can cook and create to celebrate this Dwarven holiday. I also made a vegan Beer-Cheese Soup, but I do believe the dwarves would approve of anything made with root veggies, especially something like a pot pie or Shepherd’s pie. 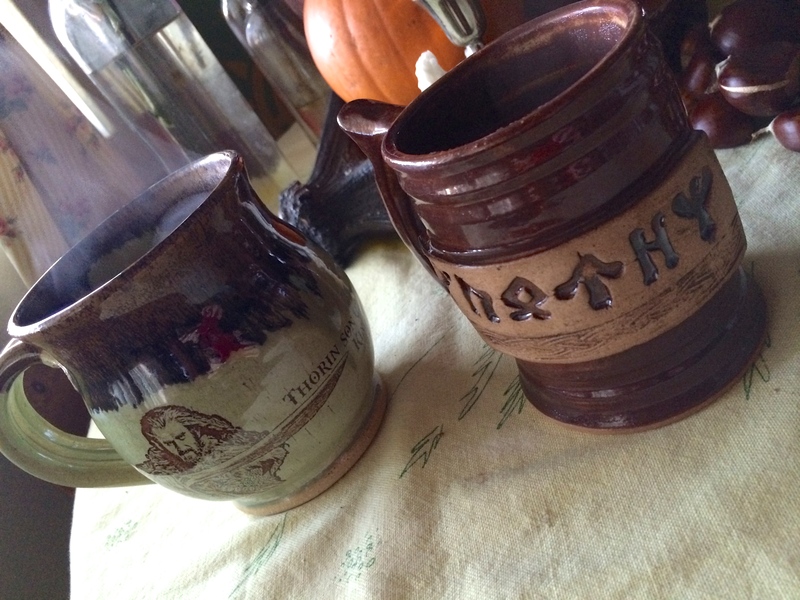 I finished off my meal and Durin’s Day celebration festivities with a mug of mulled cider. I used a dry, hard apple cider, but added some fresh-pressed cider that I made on my own to sweeten it up a bit. I also used slices of orange, cinnamon stick, whole clove and whole allspice, so the flavors would compliment the cake nicely. 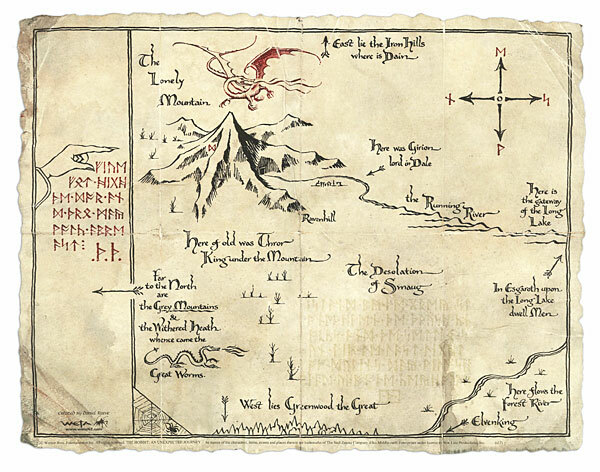 Wishing a Happy Durin’s Day to all my fellow Tolkien fans out there! ← Bombur’s Vegan “Pork” Pies and Green Salad, Balin’s Seedcake, & Bifur’s Apple Tart.